O Lord, bless this thy Angel Sword Guitar, that with it thou mayst blow Christina Aguilera and A-HA and Ricky Martin and Enrique Iglesias to tiny bits, in thy mercy. If you want it, follow these steps: first shalt thou get to eBay. Then shalt thou pay $4,500, no more, no less. $4,500 shall be the number thou shalt pay, and the number of the payment shall be $4,500. Once the number $4,500 be paid, then riffed thou thy Angel Sword Guitar towards thy foe, who, being naughty in my sight, shall snuff it. Or thou jump for a high definition image and more details. It was custom made for the Alfee's guitar player Takamizawa. This is an awesome one of a kind guitar. 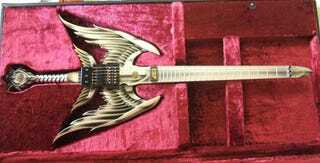 The Alfee is one of the biggest rock acts in Japan and Takamizawa is well known for his Angel and other Gothic themed guitars. Notice the cool as hell wings on this baby!!! Yes, we do notice them. But unfortunately, it won't work with Guitar Hero.